The supermassive black hole inside the core of the supergiant elliptical galaxy Messier 87 in the constellation Virgo. The black hole was the first to be directly imaged (Event Horizon Telescope, released April 10, 2019). A black hole is a region of space from which nothing, including light, can escape. According to the general theory of relativity, it is the result of the curving of spacetime caused by a huge mass. Around a black hole there is a position of no return, called the event horizon. It is called "black" because it absorbs all the light that hits it, reflecting nothing, just like a perfect black body in thermodynamics. Under the theory of quantum mechanics black holes have a temperature and emit Hawking radiation, which makes them slowly get smaller. A black hole is found by its interaction with matter. The presence of a black hole can be inferred by tracking the movement of a group of stars that orbit a region in space. Alternatively, when gas falls into a black hole caused by a companion star or nebula, the gas spirals inward, heating to very high temperatures and emitting large amounts of radiation. This radiation can be detected from earthbound and Earth-orbiting telescopes. Astronomers have also found evidence of supermassive black holes at the center of almost all galaxies. After observing the motion of nearby stars for 16 years, in 2008 astronomers found compelling evidence that a supermassive black hole of more than 4 million solar masses is near the Sagittarius A* region in the center of the Milky Way galaxy. In 1783, an English clergyman called John Michell wrote that it might be possible for something to be so heavy you would have to go at the speed of light to get away from its gravity. Gravity gets stronger as something gets bigger or more massive. For a small thing, like a rocket, to escape from a larger thing, like Earth, it has to escape the pull of our gravity or it will fall back. The speed that it must travel upward to get away from Earth's gravity is called escape velocity. Bigger planets (like Jupiter) and stars have more mass, and have stronger gravity than Earth. Therefore the escape velocity is much faster. John Michell thought it was possible for something to be so big that the escape velocity would be faster than the speed of light, so even light could not escape. In 1796, Pierre-Simon Laplace promoted the same idea in the first and second editions of his book Exposition du système du Monde (it was removed from later editions). Some scientists thought Michell might be right, but others thought that light had no mass and would not be pulled by gravity. His theory was forgotten. In 1916 Albert Einstein wrote an explanation of gravity called general relativity. Mass causes space (and spacetime) to bend, or curve. Moving things "fall along" or follow the curves in space. This is what we call gravity. Light always travels at the same speed, and is affected by gravity. If it seems to change speed, it is really traveling along a curve in spacetime. A few months later, while serving in World War I, the German physicist Karl Schwarzschild used Einstein's equations to show that a black hole could exist. In 1930, Subrahmanyan Chandrasekhar predicted that stars heavier than the sun could collapse when they ran out of hydrogen or other nuclear fuels to burn. In 1939, Robert Oppenheimer and H. Snyder calculated that a star would have to be at least three times as massive as the Sun to form a black hole. In 1967, John Wheeler invented the name "black hole" for the first time. Before that, they were called "dark stars". In 1970, Stephen Hawking and Roger Penrose showed that black holes must exist. Although the black holes are invisible (they cannot be seen), some of the matter that is falling into them is very bright. The gravitational collapse of huge (high-mass) stars cause "stellar mass" black holes. Star formation in the early universe may have resulted in very massive stars, which on collapse would produce black holes of up to 103 solar masses. These black holes may be the seeds of the supermassive black holes found in the centers of most galaxies. Most of the energy released in gravitational collapse is emitted very quickly. A distant observer sees the infalling material slow and halt just above the event horizon, due to gravitational time dilation. The light emitted just before the event horizon is delayed an infinite amount of time. So the observer never sees the formation of the event horizon. Instead, the collapsing material seems to become dimmer and increasingly red-shifted, eventually fading away. Black holes have also been found in the middle of almost every galaxy in the universe. These are called supermassive black holes (SBH), and are the biggest black holes of all. They formed when the Universe was very young, and also helped to form all the galaxies. 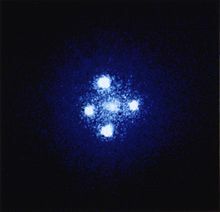 Quasars are believed to be powered by gravity collecting material into SBHs in the centers of distant galaxies. 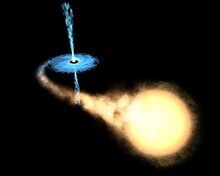 Light cannot escape the SBHs at the center of quasars, so the escaping energy is made outside the event horizon by gravitational stresses and immense friction on the incoming material. Huge central masses (106 to 109 solar masses) have been measured in quasars. Several dozen nearby large galaxies, with no sign of a quasar nucleus, contain a similar central black hole in their nuclei. Therefore, it is thought that all large galaxies have one, but only a small fraction are active (with enough accretion to power radiation) and so are seen as quasars. Artist's image: a black hole pulling off the outer layer of a nearby star. It is surrounded by an energy disk, which is making a jet of radiation. At the middle of a black hole, there is a gravitational center called a singularity. It is impossible to see into it because the gravity prevents any light escaping. Around the tiny singularity, there is a large area where light which would normally pass by gets sucked in as well. The edge of this area is called the event horizon. The area beyond the event horizon is the black hole. The gravity of the black hole gets weaker at a distance. The event horizon is the place farthest away from the middle where the gravity is still strong enough to trap light. Outside the event horizon, light and matter will still be pulled toward the black hole. If a black hole is surrounded by matter, the matter will form an "accretion disk" (accretion means "gathering") around the black hole. An accretion disk looks something like the rings of Saturn. As it gets sucked in, the matter gets very hot and shoots x-ray radiation into space. Think of this as the water spinning around the hole before it falls in. Most black holes are too far away for us to see the accretion disk and jet. The only way to know a black hole is there is by seeing how stars, gas and light behave around it. With a black hole nearby, even objects as big as a star move in a different way, usually faster than they would if the black hole was not there. Since we cannot see black holes, they must be detected by other means. When a black hole passes between us and a source of light, the light bends around the black hole creating a mirror image. That effect is called gravitational lensing. Hawking radiation is black body radiation which is emitted by black hole, due to quantum effects near the event horizon. It is named after the physicist Stephen Hawking, who provided a theoretical argument for its existence in 1974. Hawking radiation reduces the mass and the energy of the black hole and is therefore also known as black hole evaporation. This happens because of the virtual particle-antiparticle pairs. Due to quantum fluctuations, this is when one of the particles falls in and the other gets away with the energy/mass. Because of this, black holes that lose more mass than they gain through other means are expected to shrink and ultimately vanish. Micro black holes (MBHs) are predicted to be larger net emitters of radiation than larger black holes and should shrink and dissipate faster. ↑ The Event Horizon Telescope Collaboration (10 April 2019). "First M87 Event Horizon Telescope Results. I. The Shadow of the Supermassive Black Hole". The Astrophysical Journal Letters 87 (1). https://iopscience.iop.org/article/10.3847/2041-8213/ab0ec7. Retrieved 10 April 2019. ↑ Michell J. 1784. "On the means of discovering the distance, magnitude, &c. of the fixed stars, in consequence of the diminution of the velocity of their light, in case such a diminution should be found to take place in any of them, and such other data should be procured from observations, as would be farther necessary for that purpose". Philosophical Transactions of the Royal Society 74 (0): 35–57. doi:10.1098/rstl.1784.0008. ↑ Gillispie C.C. 2000. Pierre-Simon Laplace, 1749–1827: a life in exact science. Princeton paperbacks. Princeton University Press. p. 175. ISBN 0-691-05027-9. ↑ Israel W. 1989. "Dark stars: the evolution of an idea". In Hawking, S. W.; Israel, W. (eds.). 300 years of gravitation. Cambridge University Press. ISBN 978-0-521-37976-2. ↑ Hawking S.W. & Penrose R (1970). "The singularities of gravitational collapse and cosmology". Proceedings of the Royal Society A 314 (1519): 529–548. doi:10.1098/rspa.1970.0021. ↑ Rees M.J. & Volonteri M 2007. "Massive black holes: formation and evolution". In Karas, V; Matt, G (eds.). Black holes from stars to galaxies—across the range of masses. Cambridge University Press. pp. 51–58. arXiv:astro-ph/0701512. ISBN 978-0-521-86347-6. ↑ Penrose, Roger 2002. "Gravitational collapse:the role of general relativity". General Relativity and Gravitation 34 (7): 1141. doi:10.1023/A:1016578408204. http://www.imamu.edu.sa/Scientific_selections/abstracts/Physics/Gravitational%20Collapse%20The%20Role%20of%20General.pdf. ↑ Thomsen D.E. 1987. End of the World: you won't feel a thing. Science News 131 (25): 391. ↑ Davies P.C.W (1978). "Thermodynamics of black holes". Rep. Prog. Phys 41: 1313–1355. http://cosmos.asu.edu/publications/papers/ThermodynamicTheoryofBlackHoles%2034.pdf. This page was last changed on 11 April 2019, at 16:23.